Home · News · News · Get Inspired! Enter the Wissahickon Photo Contest. Get Inspired! Enter the Wissahickon Photo Contest. Artists, photographers, writers, poets, and musicians can all claim the Wissahickon Valley as a muse. So what’s stopping you from joining their ranks and entering the Biennial Wissahickon Photo Contest 2016? This year’s contest is being presented by FOW and the Wissahickon Valley Watershed Association and the deadline is October 14. Learn more here. If you need inspiration, here’s a short list of contemporary photographers of the Wissahickon to get your creative juices flowing. Melvin Chappell. An award-winning photographer, Chappell’s book, The Wissahickon Valley: The Photography of Melvin A. Chappell (2015), contains 28 of his favorite photos of the park. His work has been used by FOW and other organizations, such as Historic RittenhouseTown and the Morris Arboretum. 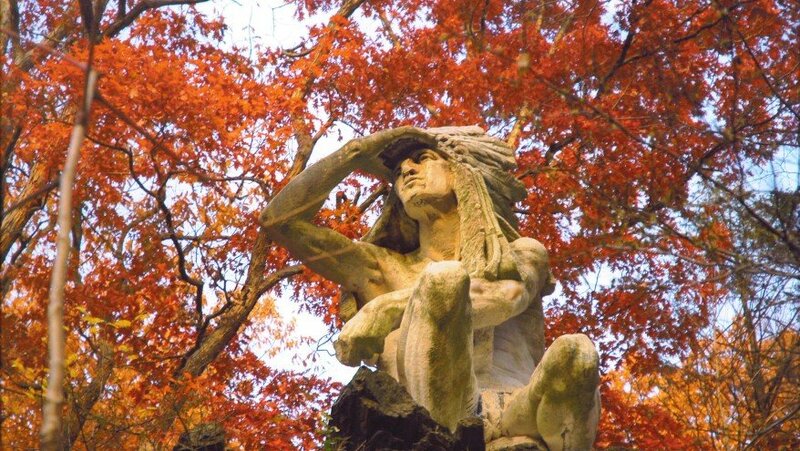 His photograph of the Indian Statue won Best in Show in FOW’s Biennial Photo Contest in 2008. Many of his photographs can be found in numerous private and public collections around the world, including the permanent collections of the African American Museum in Philadelphia and the Woodmere Art Museum. You can view some of his Wissahickon photos here. Allison Ostertag. The Executive Director of the Whitesbog Preservation Trust in New Jersey, Ostertag is an environmental educator, landscape designer, artist, and photographer with a master’s in Landscape Architecture. She works with communities and businesses to green their spaces with ecological restoration, habitat creation, community engagement, and stormwater management. View some of her Wissahickon photographs here. Ruth Pfeffer. An expert birder and photographer, Pfeffer is the owner of Birding with Ruth. She is credited with creating the birding program at the Morris Arboretum, where she is an instructor. She has led birding expeditions throughout the Mid-Atlantic region and abroad since the 1990s and contributed to the Breeding Bird Atlas project in the 1980s. View some of her Wissahickon bird photographs here. Jamie Stewart. This local photographer dedicates his time and talents to support local non-profit organizations that help to protect the environment. A former member of the Wissahickon Valley Watershed Association’s board of directors, he allows WVWA to use his photos to illustrate the mission of protecting the Wissahickon Creek by protecting open space within the Watershed. Many of his photos were featured in Wissahickon: Worth Preserving (2007). He is the judge of this year’s Biennial Photo Contest. View his photos here.